Get a Salesforce implementation fully customized to your business needs. What if Salesforce was made just for your business? Salesforce CRM has thousands of features, and just as many customization options. Making it work for your business is hard enough, but as your business grows and evolves its needs change. We can help you configure Salesforce, customize it with integrations, re-engineer business processes, and even help develop custom apps specifically for you. Your tools should work for you – not the other way around. We’ll help you get there. Even though Salesforce has countless options, the way your business functions should dictate how this tool is configured. 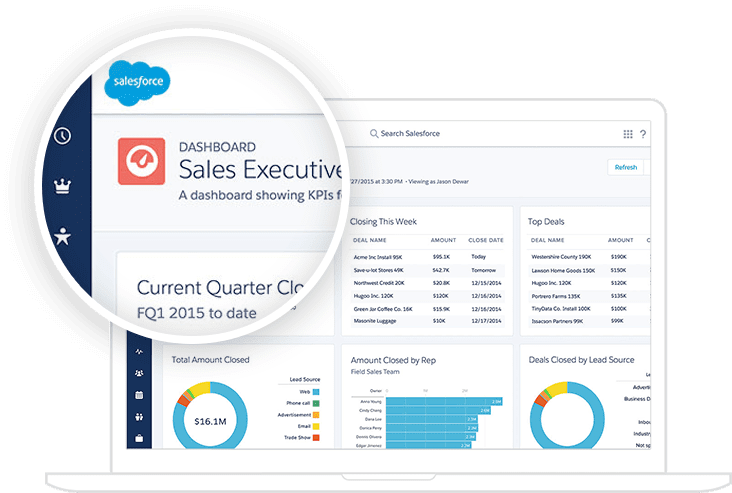 We will set up Salesforce to present just the essential data and components to your users, intending to optimize work flow. Let’s face it: Salesforce isn’t that fun to use, and one of the biggest hurdles to user adoption and retention is usability. We will customize the interface using APEX (a programming language) and VisualForce (a platform for front-end framework) so that everyone knows how to use Salesforce and navigate to the places they need to be. Although Salesforce does a lot, it doesn’t do everything. We will add the functionality you need, including custom calculations, triggered actions, workflows, and more. However you want Salesforce to work for you, we can help. You can use the data and functionality of other apps along with Salesforce. We’ll integrate your cloud apps, even with two-way sync, so your business practically runs on autopilot. Learn more about our Salesforce Integration Services . Sometimes you need functionality that’s beyond a custom configuration or integration. We can build apps from scratch that do exactly what you need them to, right within Salesforce. Learn more about our custom application development services. The Salesforce Community cloud engagement platform lets you grow your business in many ways by staying connected to customers, partners and employees. These communities lower your marketing costs, increase sales, reduce customer service costs, build your partner network and reduce employee turnover. We help you implement and customize all three types of communities, whether it’s team discussions, groups, gamification, analytics, moderation — everything that you need to run your organization collaboratively and efficiently. Engage your customers with a fulfilling self-service community experience that saves you time and helps you sell better. Help resellers, distributors and partners grow their business and yours with a community that’s custom built to meet their needs. Retain employees longer in a branded community that makes them happier and more productive. Salesforce is a powerful tool, but only works when your team uses it properly and when it solves real business problems. Business happens across all departments and locations. That often means that your Salesforce users have significantly different use cases, including work environments and data entry needs. Whenever we see Salesforce adoption problems, we know it’s really an issue of usefulness. This is why we only show your users the information they need to see. Your business objectives and needs should lead your Salesforce customization project. That’s why we begin with understanding your company and your business challenges. Our team will begin by properly configuring features already built into the app. However, if you need further customization to increase productivity, improve data quality, or automate manual processes, we will create the custom solutions you need. Find out which Salesforce customizations will make the biggest impact for you. Set up a call and we’ll give you a timeline and budget to get started. We design, develop, and carefully deploy apps so that you can focus on your business. Our custom applications are easy to scale and maintain on Salesforce’s custom platform – Force.com – using Salesforce as the engine. Salesforce1 can port your apps to mobile to empower your users wherever they are. Learn more about our Salesforce App Development services. Force.com accelerates the pace of innovation for custom apps. It uses a web-based application layer, has minimal coding requirements, and provides numerous development tools that are constantly being refined to shorten the development cycle. Force.com provides two options for creating and customizing the user interface (UI) of platform applications. For more complete UI control, Force.com includes VisualForce, a complete framework for creating and running virtually any UI for any application on any device. Salesforce.com performs both internal and external vulnerability assessments on a regular basis. All Force.com data centers are SAS 70 Type II, SysTrust, and ISO 27001 certified. Force.com infrastructure design can scale both vertically and horizontally. Its unique pod architecture offers a set of industry-standard resources: high-performance database, application, search, email, load balancers, storage, backup servers, and more. Force.com’s workflows tool will manage and automate your business processes. By better managing and automating these processes, organizations can not only improve their workers’ productivity, but also make their operations more reliable. Custom applications built on the Force.com platform help reduce users’ annual downtime. A collection of systems management tools closely monitor Force.com’s health and performance 24/7, alerting the platform’s team of specialized engineers to potential problems and resolutions. Force.com: A Comprehensive Look at the World’s Premier Cloud-Computing Platform Force.com is cloud computing for the enterprise. Using the Force.com platform, private enterprises and commercial software providers alike can quickly create and run custom business applications over the Internet, without the need for up-front software and hardware expenditures, configuration, and maintenance. This article looks at the mechanisms for storing data in Salesforce and at the concepts of objects and fields. Let's put Force.com and Salesforce CRM to work for you. Don’t Wait: Set up a call with a certified Salesforce expert to find out how a customized Salesforce org can improve adoption.